In this closet (shared by two boys) Jen at iHeart Organizing put images on bins using her Silhouette so her littlest boy would know where things are. Once again, Jen had a great idea when she used Ikea’s trofast to organize her boys’ legos. The boys decided to sort them by color. Jen made the labels with her Silhouette. This closet is beautiful to look at, and I’m sure, to use. The bins at top can hold out of season clothes and hand me downs. 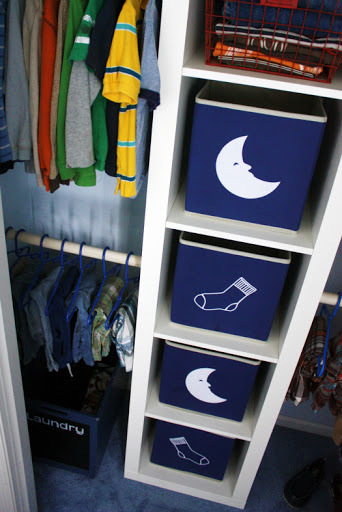 The middle bins ﻿can hold items you use a bit more often than the clothes above it (diapers, wipes, creams, etc. would work well here). 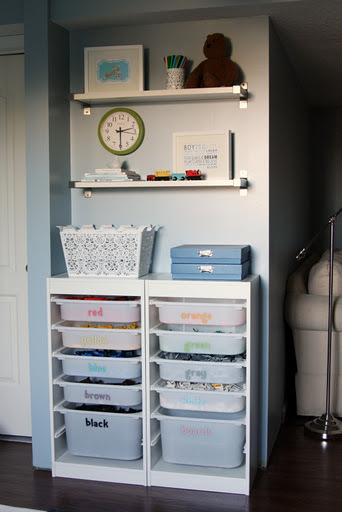 You can achieve this result by buying shelving and brackets from a home improvement store, the four-cube expedit from Ikea with the drawer inserts and bins (here and here). The bright bins on a neutral background make the closet look clean and crisp.